Sabang is a lovely Palawan destination and we’re really glad we took the time to visit beyond just the Underground River. 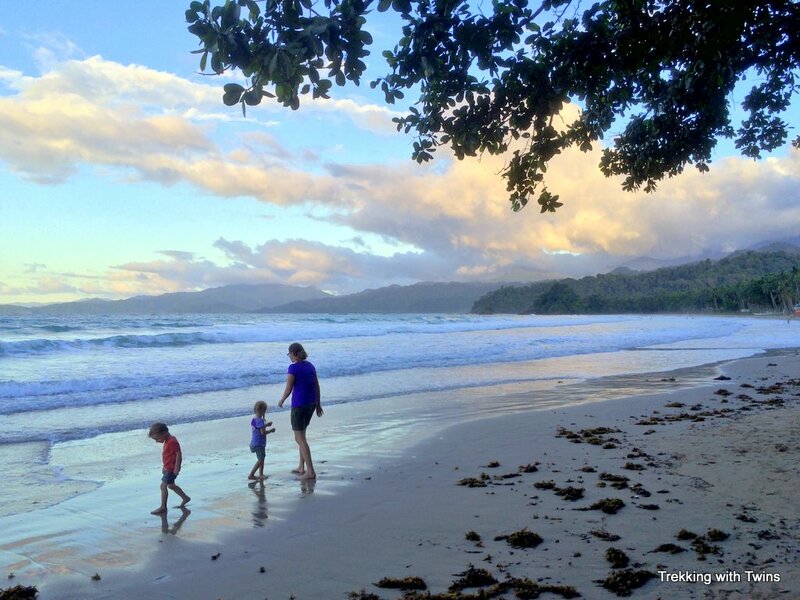 The beach is rugged and beautiful and there’s plenty to keep you busy for a few days at least. Here’s the lowdown on what else we did in Sabang (besides trekking to the Underground River), how to get Sabang, where eat and where to stay. Exhausted after our jungle trek to the Underground River, but not wanting to miss an opportunity to see some cool stuff we decided to take in the mangrove forest tour that same day on our way out of the jungle. 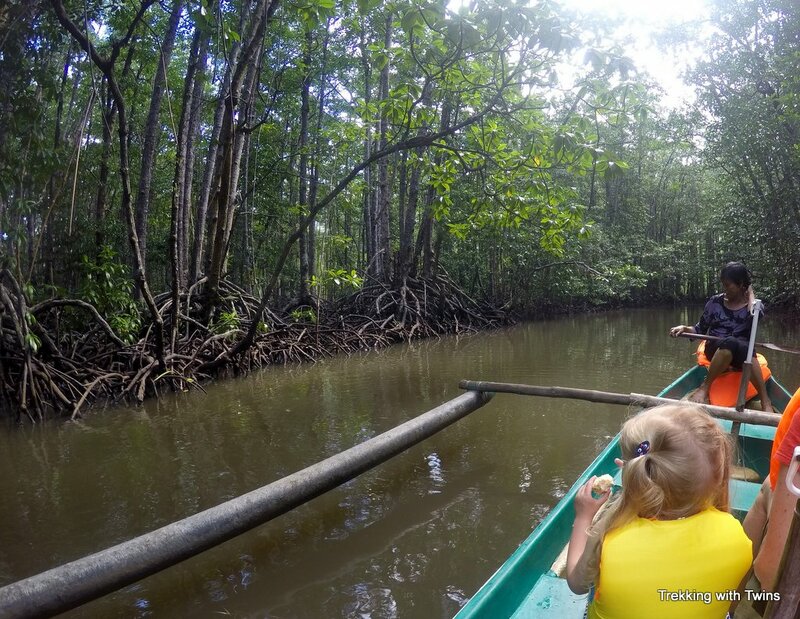 This tour is a quick ride up and down the river among a variety of mangrove trees and wildlife. Our guide for this journey was “Lady Mangrove” and she treated us to a great story of the forest, including describing the types of trees, how they grow, the history of the area, and what animals live in the forest. We spotted a couple big monitor lizards in the trees overhanging the river, but even more exciting, we saw big pythons curled up in the branches above our heads. 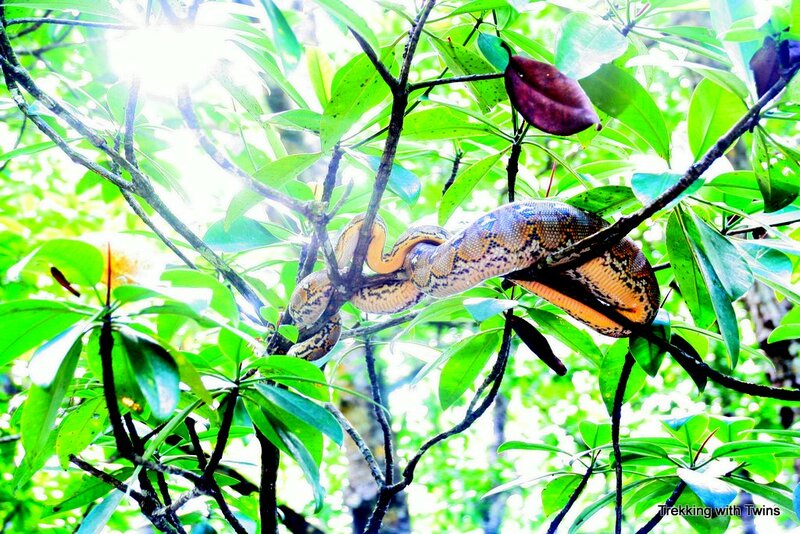 We had no idea that snakes climbed trees! Cruising the mangrove forest with Lady Mangrove. This python was right over our heads! Towards the end of the tour Lady Mangrove shared a song with us that she composed herself about the mangrove forest, which was really sweet. 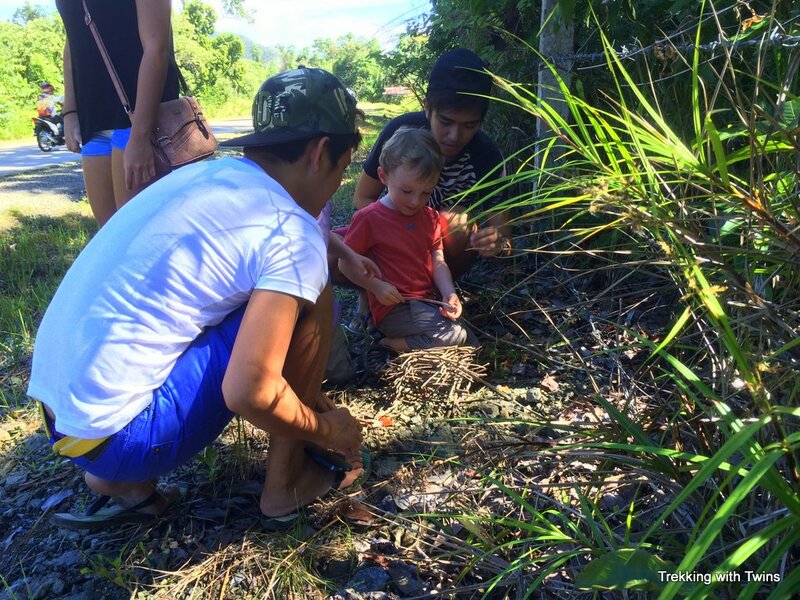 When we disembarked from our boat she also found a couple of mangrove seed pods for the kids, which she proceeded to instruct them to plant. She showed them the right way to do it so that they will grow into new mangrove trees. Ok, who knows if anything will really grow, but it’s a nice idea. The kids got a kick out of it either way and we thought it was touching. 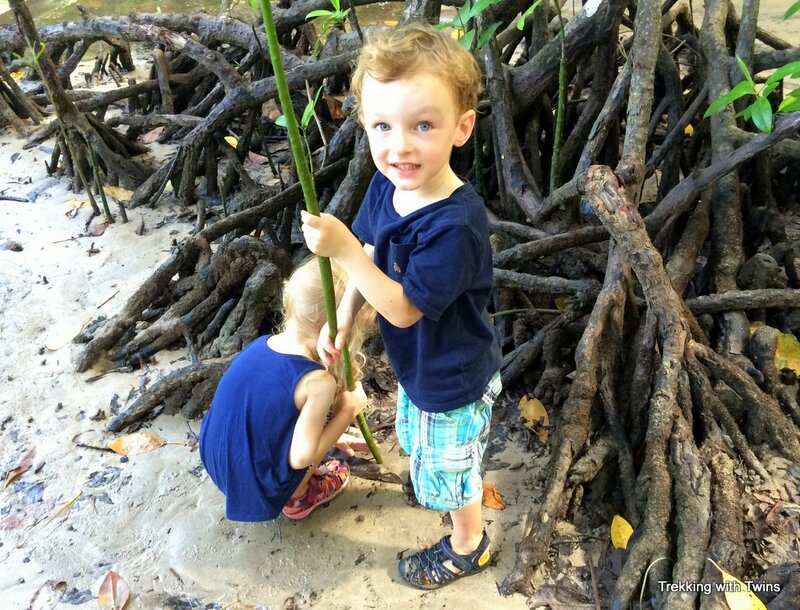 The mangrove planting game has also provided hours of entertainment at all subsequent beaches where we have found the seed pods. I think we’re planting the next generation of Philippine mangrove forests! 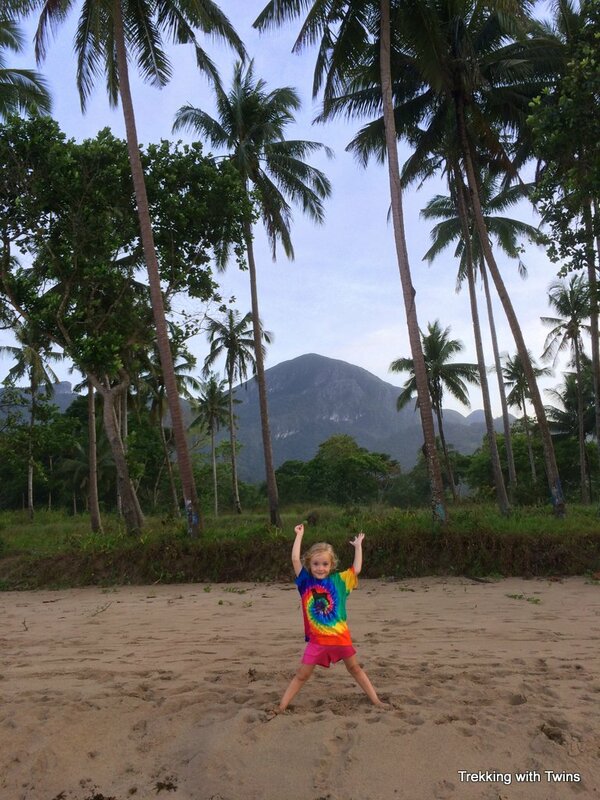 We spent most of the rest of our visit to Sabang wandering up and down the beach. Sabang Beach is stunningly beautiful. The surf pounds a long, wide stretch of sand lined with coconut palms. The whole beach is surrounded by craggy mountains and the light in the morning and evening accentuates all of this wild natural beauty. 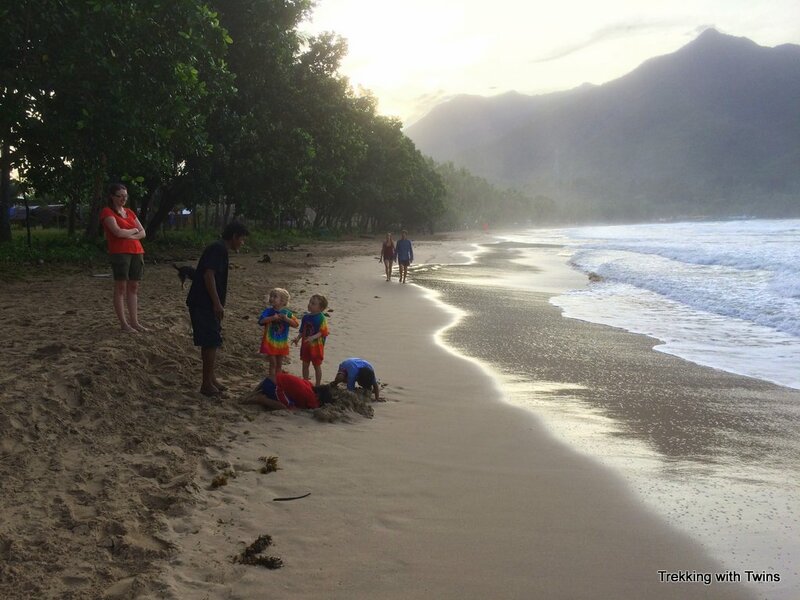 Keep in mind that it’s really unsafe to swim on Sabang Beach most of the time. We didn’t swim at all while we were there as there were severe surf warnings every day. There is apparently a very strong undertow and we heard stories of several drownings. I consider myself a very strong swimmer but I didn’t think twice about avoiding the water here. There’s a whole range of accommodation along Sabang Beach and we had no trouble finding a place to rest our heads, even in supposedly high season. We arrived in town with no reservation and could have picked from a few different options. There’s everything from very basic budget huts to a couple of high end posh resorts so regardless of your budget and taste you should be able to find something. When we stepped off our van from Puerto Princesa there happened to be a guy from Green Verde, a place we had pegged as a top option, waiting for potential customers. He offered a no obligation ride on his moped to check out the room, so I took him up on it while Kat waited with the kids and our luggage. Green Verde is about a 5 minute walk from the harbor and “van terminal” (nothing more than a podium and couple chairs), right across the walking/moped path from Sabang Beach. It looked like all of the accommodations at Green Verde had ocean views. The view from our porch at Green Verde. We had our choice of two cottages. Both had a double bed and a twin bed as well as ensuite bath with cold shower. The cottages both had a nice porch with table and chairs. 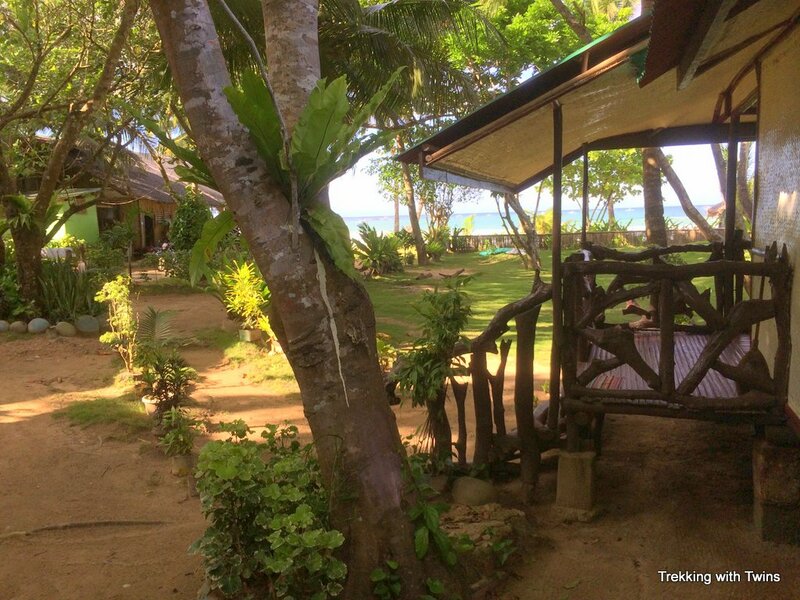 I picked a cottage and negotiated a decent price (900 pesos a night, about $20). The guy brought me back to the harbor and then helped us bring our bags down the beach. Seeing him cross a skinny wooden bridge on his moped, balancing a suitcase between his arms and wearing one of our backpacks was quite a sight! We really enjoyed Green Verde. The accommodations are rustic but totally functional and the location was perfect. There’s great access to the beach and to town, as well as the mangrove tour and Underground River trail. 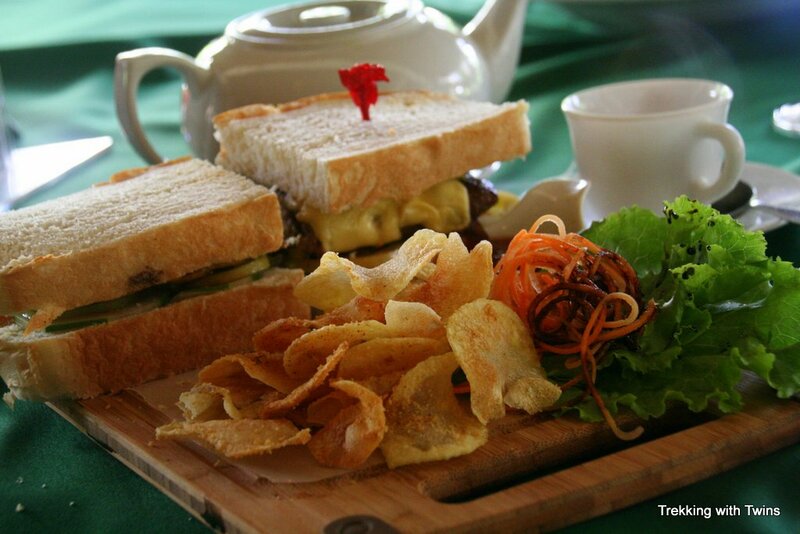 There’s an on site restaurant at Green Verde that served terrific food for reasonable prices. We ate there a lot! The restaurant is right on the beach path and has an ocean view. There’s free wifi at the restaurant but not in the rooms so I spent some evenings there writing. It was an inspiring place to sit, with the strong Sabang winds whistling through the open air restaurant, spinning and twisting the many wind chimes that were hung around it’s edges. Besides the Green Verde restaurant the one meal that stands out from our visit to Sabang was lunch at the Daluyon Resort. We plowed through some delicious sandwiches and the kids were in love with the milkshakes that we ordered, all for surprisingly reasonable prices given the high end resort location. The only real downside of Sabang is getting there. We arranged our transport from Puerto Princesa to Sabang on Lexus Shuttle. We would recommend that you consider other options. Our van was supposed to pick us up at our hotel in Puerto Princesa at 8 a.m. We dutifully packed out belongings and assembled ourselves by the roadside by 7:50. The woman who ran the little sari sari at the end of our hotel’s driveway laughed and said we would be waiting a while. It turns out she was right. After several phone calls and text messages to Lexus, the van finally showed up at about 9:15. 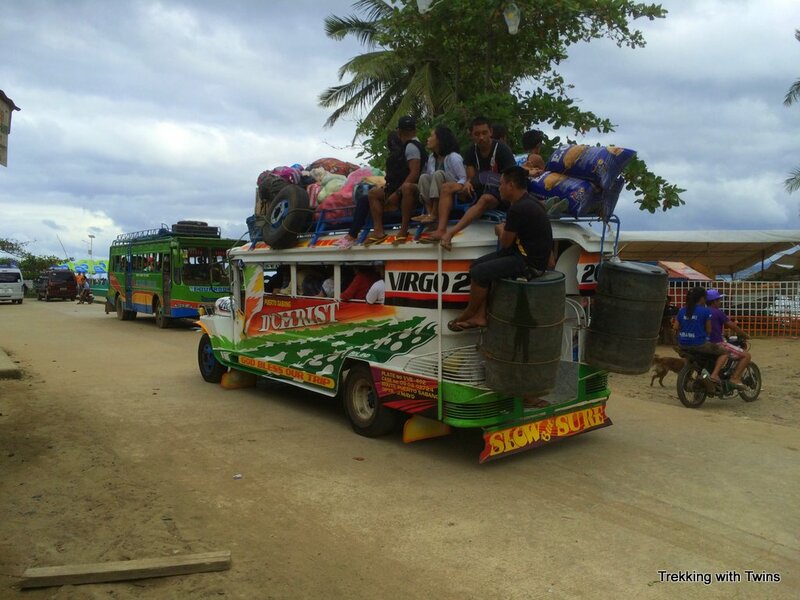 After our late start the van drove to the terminal just north of the Puerto Princesa city proper and loaded up with more passengers. We then continued north for about an hour before I started noticing the driver texting a lot while he was driving. Before I could get too irritated by this he pulled over said something in Tagalog. Some folks in the back started to get out and we learned that there was a brake problem and we would need to wait for another van to come rescue us. Broken down by the side of the highway on the way to Sabang. As we were an hour outside of Puerto (and at least an hour from Sabang) we would need to wait at least that long for another van. It turned out to be nearly two hours of waiting on the side of the highway. The kids were miraculously well behaved through all of this, in large part due to some fantastic babysitting by our fellow vanmates. 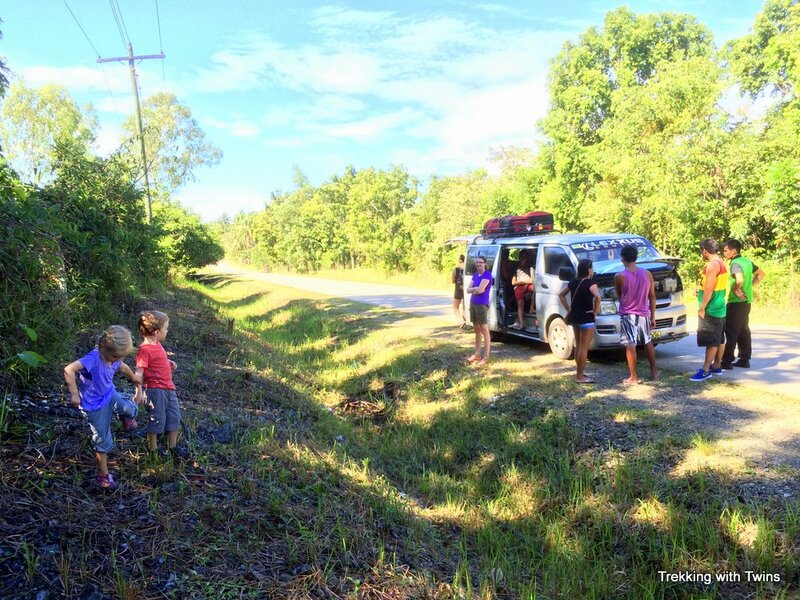 Our awesome vanmates helping to keep the twins entertained during our pit stop. Once we were finally rescued we continued on our way and the rest of the ride, while somewhat white knuckle, was at least uneventful. The total trip should take about 2.5 hours. Ours was over 5 if you count the time wasted waiting for the very late pickup. We now know that van rides in the Philippines just aren’t our thing, but this one was one of the worst. In fact two out of three legs that we took with Lexus were terrible. Perhaps it was just our luck, but we wouldn’t use them again. For those that read our previous post about the van ride from Boracay to Kalibo and are thinking we just hate all van rides, it’s only partially true. Our one halfway decent van trip was the long one from Sabang to El Nido. That was also on Lexus, so perhaps there’s hope. Besides the Lexus van there may be other van operators that run this route. We just couldn’t find them online before our visit and we wanted something booked as our trip was very close to Christmas. You could also take any of the many vans that go direct from Puerto Princesa to El Nido and hop off at Salvacion Junction. From there you can take a jeepney the rest of the way to Sabang. We didn’t think this was practical with all of our luggage and the two kids. A jeepney arriving in Sabang. With a stunning beach, a wonder of the world, and plentiful cheap accommodation and food Sabang has a lot going for it. We were really glad we spent a few days there. Some of the most amazing times to walk the beach and appreciate the breathtaking natural beauty of the area are mornings and evenings. You wouldn’t see these times if you only visited Sabang as part of a day tour from Puerto Princesa. Getting between Sabang and anywhere is challenging but it’s absolutely worth the trouble. Note: At Green Verde I offered to write about our stay as part of the room rate negotiations, though I honestly have no idea if that helped my cause. Hello. I just got through reading your post about Sabang. 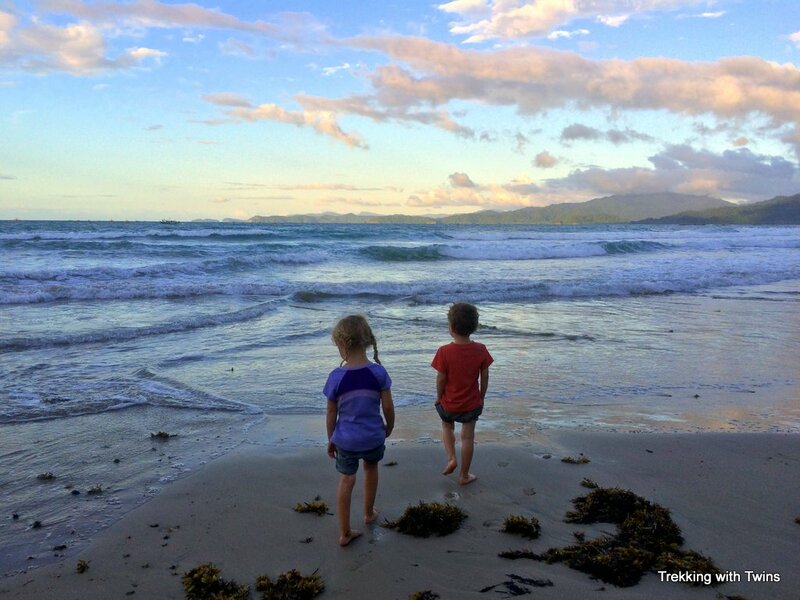 We will be traveling to Palawan in a few months with our 7 year old son, so I hope you don’t mind me asking a few questions. You mentioned van rides not being your thing….which method of transportation would you recommend for getting around with a child? Were there any beaches in Sabang that you could swim at? Could you visit any islands from there?? I also read your side note about you negotiating the room price for posting about their place…..is is common to negotiate room prices in the Philippines….even for people who don’t write blogs. I’m really enjoying reading your posts. They are filled with tons of the exact details that I am looking for, for our trip. Thank you. Hi Cara! Wow thanks for the awesome comment, lots of good questions. Glad to hear you’re headed to Palawan!! It’s paradise. Yeah… getting around is tough (but worth it). Here’s the thing, if you want to see Sabang, you have to deal with the van. Perhaps you could rent a car, but we didn’t look into that. Driving would be a bit scary I think (it was scary enough with someone else driving). Don’t be afraid to demand that your van driver slow down too, if you feel unsafe (some of them drive recklessly). If you are going just to El Nido, or just Puerto Princesa, then you can fly and avoid the vans. We talk about the ways to get to El Nido in more detail here. No beach swimming or island hopping in Sabang. It’s literally one beach (super rough surf) with some huts along it. But it’s gorgeous and a great relaxed atmosphere. There’s the underground river and mangrove forest, plus I think a couple of other attractions that we didn’t get to. Whether you should stop in Sabang or not depends on how much time you have. We saw a lot of folks jamming in a day trip to the underground river, followed by a couple of days in El Nido, and then back to Puerto to fly home. With that schedule your van to paradise ratio is way off. If you have some time to take it slow, then it’s absolutely worth extending the potentially awful van ride to get there on the way to El Nido. Definitely negotiate! Be friendly, joking, and have fun, but negotiate. If you’re polite and ask with a smile, worst case is someone says no. If you’re booking ahead you may not have a lot of success, but we did negotiate some rates even over email or text. Have a blast, we miss the Philippines! !